I have to admit that living in Tucson has changed our perspective on winter a little. All the news stories on TV about major winter storms, freezing temperatures, airport & highway problems, etc. have seemed a bit unreal as we have shivered our way through days where the temperature barely reaches 72 degrees. We figured that by the time we got to the southeast the weather would have changed and I-10 would be a safe route to get to Florida. Indeed, as we drove through New Mexico yesterday under clear skies and warm air, the prospect of bad weather seemed impossible. And yet, in the afternoon after leaving El Paso (where we stopped for some nice Texas brisket), there was a chill in the air. By the time we reached Van Horn it was distinctly cool, enough to make me shiver in a long-sleeved shirt, and then to our dismay we watched as the temperature dropped into the thirties in a very short time. By the time we reached Balmorhea State Park in west Texas, it was nearly freezing and the sky had clouded over in a grim and vaguely threatening way. Even though the spring-fed outdoor pools were as warm as bathtubs in this park, it was far too cold to enter without calling it a Polar Bear Dip. 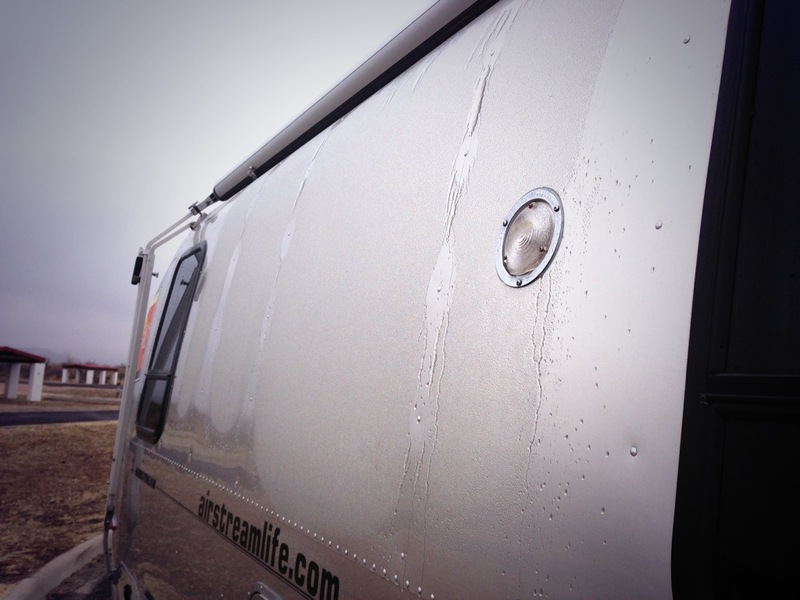 In the morning we found the Airstream covered in ice, and a forecast of “freezing fog and freezing drizzle” along our route. We delayed a while, then hit the road, but I wasn’t happy with conditions as the temperature remained in that dangerous zone of about 27-28 degrees where freezing rain is possible. 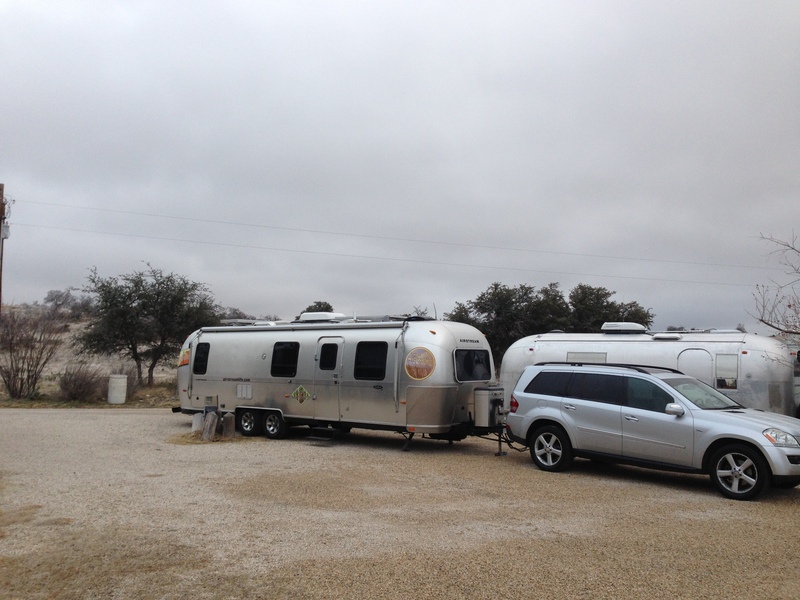 We stopped for lunch in Ozona, but the weather was unimproved when we moved out again. Finally, with the prospect of making our destination near sunset and a very fine mist on the windshield, I called Alex on the radio and announced we were going to bail out. Since we only covered 200 miles today, this is going to put us behind schedule, but continuing on wasn’t worth the risk. Fortunately we were near Caverns of Sonora (Sonora, TX) where there’s a pleasant little campground that we’ve visited before. And I needed some time to catch up on work. So all seemed well, and I was happy with the decision to stop early. 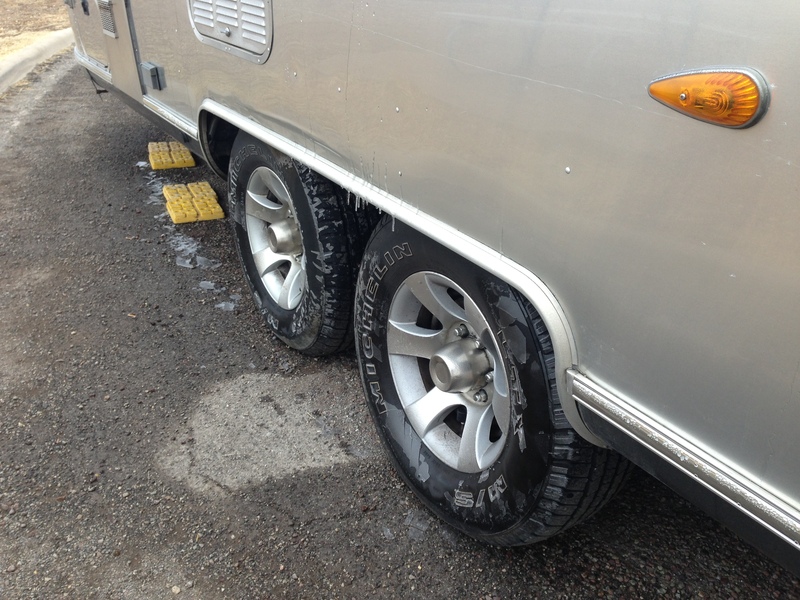 The weather outside remained just awful outside but warm enough in the Airstream and we have an electrical hookup too. Then the next problem cropped up. The water pump started cycling when we weren’t using the water. There’s only one reason for that: a leak in the fresh water plumbing system. I went outside to find water dripping from the bellypan, then started tearing out drawers inside, in an attempt to find the leak. Eventually I isolated it to the fresh water fill. It has sprung a leak. There’s nothing I can do about it (because there’s no convenient shutoff valve) except leave the water pump off when we don’t require water pressure. This has changed our plan yet again. We were already accepting that tomorrow we might not get on the road until afternoon, when the threat of freezing rain is supposed to abate, and now our first stop will have to be an RV parts store somewhere along I-10. Oh well, at least it’s a 30 minute fix and I have all the tools and caulk here with me. Looks like we will be late getting into Sarasota, but I won’t officially make that call until Thursday, when hopefully the weather will be better and we have had a chance to make up some time. Tonight we are going to have dinner together here in our trailer, and forget our troubles in the warmth of an Airstream. What else can you do? Hope everyone is feeling better. Have a safe drive.